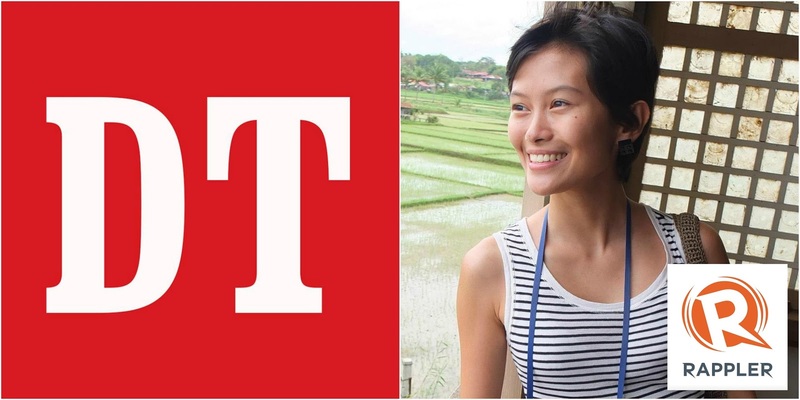 Thinking Pinoy: Why did Duterte supporters bash Rappler’s Pia Rañada? Why did Duterte supporters bash Rappler’s Pia Rañada? Miss Pia Rañada-Robles, let me explain why you got bashed. 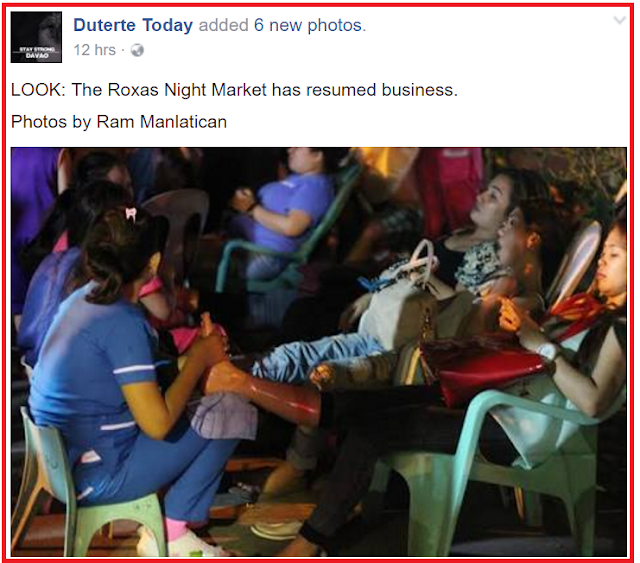 At 9:16 PM last night, Duterte Today (DT) posted a status update claiming that the Roxas Night Market, the site of the fateful bombing incident, has resumed business on the evening of 04 Sept 2016. Duterte Today readers took offense on your post and you got bashed as a result, with some commenters even going as far as calling you “bugo”, which is Bisaya for idiot. I am not really sure if understanding context clues, or even the ability to read previous comments is part of, as Rañada-Robles puts it, “what reporters do”. However, if she actually bothered to read the comments, the answers are already there. Let me spell this out for Rañada-Robles not only for her benefit but also for the benefit of every member of the national mainstream media who may have probably experienced the same. So, Ms. Pia Rañada-Robles, let me spell this out for you. I think Rappler’s general reputation is hardly debatable from the point of view of the Duterte crowd, and you know what I mean. Just look at how your organization tried to irresponsibly stir up the anti-Duterte noise just a few days before the elections with your poorly-researched Duterte P. Guevarra Property article [TP: P Guevarra]. You commented on Duterte Today, a Duterte-leaning page, so you can expect a Duterte-leaning crowd to read your comment. And that’s exactly what happened. The Duterte crowd isn't very fond of Rappler, then add the fact that the Duterte crowd generally doesn’t like you in particular. In June 2016, you disrespected Duterte in front of his face [TP: Big Ego]. Yes, you can argue the justifications for your actions, but the fact remains that Duterte supporters will see it at an act of condescension against the president. They will obviously not like you for that. You say that you are a reporter. Now, a reporter’s job is to relay the news, and not pretend to be a part of the morality police. Reserve that for opinion-editorial (Op-Ed) columnists, and you weren’t in that press conference in that capacity. In August 2016, in another Rappler article, you reported what you perceived to be Duterte’s threat to Chief Justice Sereno [TP: Martial Law]. Instead of just reporting what happened like what’s expected from news reporters, you editorialized that article. To make matters worse, your “insights” leave much to be desired. Stated simply, Rappler’s reputation, plus your recent history, makes Duterte supporters distrust you. That’s why Duterte supporters will interpret your words with greater suspicion, words that would have been innocuous if asked by someone from, say, Mindanation or SunStar Davao. I am not saying that Duterte supporters are justified in their decision to distrust you. Instead, I am saying that you should stop asking why they act that way because you should already know why. Duterte supporters see you as a reporter with a questionable agenda. Trust can be rebuilt and you had the opportunity to do that in the comment, but you didn't take advantage of it. In the 1880s, Joseph Pulitzer hung a sign in the newsroom of his paper, the New York World, which read: “The World has no friends.” But this view of traditional objectivity in journalism is outdated. A major reason for this is that the journalist’s ability to understand and connect with people is essential for learning about stories, and compassion allows journalists to do this more fully. In our current media environment that so often deals with victims of tragedy, a sense of compassion undoubtedly plays a part in journalists’ ability to understand people in the news. You failed to show empathy. You failed to show compassion. Hence the readers’ animosity towards you. Yes, I have chosen to use pointed language in my articles against mainstream journalists in the past several months, and I think your organization is well aware of that. The problem, however, is that journalists are expected to be thicker-skinned. Regular citizens, on the other hand, are not expected to be such. Pia, set aside your spoiled brat mentality, be more sensitive of the plight of the tragedy’s victims, and you will be pleasantly surprised at how the crowd will react to you. First, you asked DT the exact time they took the Roxas Avenue pictures. 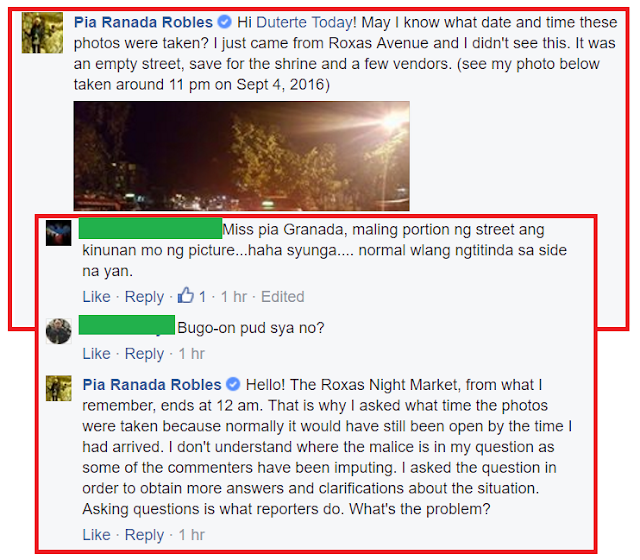 Second, you said it isn’t consistent with a photo you took that showed a practically deserted Roxas Avenue. Third, you showed the photo you took. Your comment, in general, wants to verify the authenticity of DT’s post. Fair enough. It would’ve saved you a lot of trouble if you just stopped right there. But that wasn’t enough for you. You felt (and heeded the) need to say it’s already practically deserted by 11 pm, with the photos to show for it, even if it was neither the right time nor the right place to say such a thing. Your naivete or worse, your need to prove yourself right, got the better of you. While the second and third points were valid, they only served to put the DT sympathizers on the defensive, as you tacitly imputed that DT is an unreliable news site. DT’s actual credibility is not the issue here. Instead, it’s the amalgamation of DT being one of the most vocal supporters of the tumultuous Duterte Campaign, and the trust that DT followers feel because of that. Stated simply, your comment, aside from lacking compassion, also lacked prudence. To wrap this article up, let me answer your follow up comment in the nicest possible way. I say, "That is also correct, but you also asked for bashing when you gave too much information."